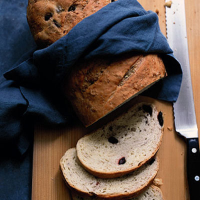 A delicious bread to accompany any meal - best served warm. Sift the flour and salt into a large bowl and stir in the sugar and yeast with half the fennel seeds, 1 tbsp of the oil and 425ml of lukewarm water. Mix to a soft dough, then transfer to a floured worksurface. Knead for 6-8 minutes, until smooth and elastic. Knead in the olives until evenly distributed. Place in a clean, oiled bowl and cover with a clean tea towel. Set aside in a warm place for 1-2 hours, until doubled in size. Turn the dough out onto the worksurface and knead again briefly. Shape into a sausage shape about 32cm long and slash the top a few times with a sharp knife. Transfer to a lightly oiled baking sheet. Scatter the rest of the fennel seeds and a little flaked sea salt over the top. Drizzle over the rest of the oil. Cover with a tea towel and leave to rise again for 20 minutes. Preheat the oven to 230°C, gas mark 8. Bake the loaf for 30-35 minutes, until risen and golden, and it sounds hollow when tapped on the base. Cool on a wire rack before slicing. Dust the olives in a little flour to make it easier to knead them in.